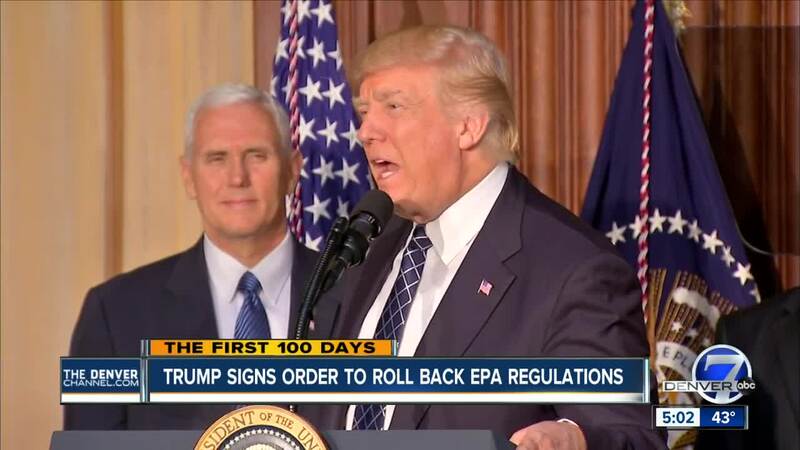 DENVER – President Donald Trump’s executive order Tuesday aimed at ending Obama-era climate change rules and curbing climate regulation enforcement sent ripples across Colorado’s political spectrum. Colorado Democrats hammered Trump and his order to review and possibly rewrite the Clean Power Plan as a major threat to the environment and peoples’ health, but the order was lauded by state Republicans, who said that the order would free up the energy sector to expand the nation’s economy. Trump himself says that the order would revive the coal industry, which had been in a steady decline since the mid-1980s, but lost more jobs and money at the onset of the Great Recession and thereafter. He pledged during his campaign that he would undo Obama’s plans to cut down on fossil fuel emissions, and this order does just that by stripping a handful of regulatory measures. The Clean Power Plan, which required power plants to reduce their carbon pollution by 32 percent by 2030, is the main target in the order. The Obama-era order has long been targeted by coal and oil and gas-rich states and companies that say it hampers their ability to profit from their natural resources. Trump has also campaigned to bring coal jobs back to an industry that has suffered major losses, though the industry represented just 0.12 percent of the U.S. workforce according to Bureau of Labor Statistics . In 1920, coal mining jobs alone made up nearly 2 percent of the U.S. workforce. The Energy Department said in January that coal mining jobs amount to only 75,000 across the county, but there are approximately 650,000 renewable energy jobs in the U.S.
Another facet of the order strips a three-year moratorium imposed in January 2016 on the granting of coal leases on federal lands, and other parts of it roll back rules aimed at reducing carbon and methane emissions. Both Trump and EPA chief Scott Pruitt have made alarming statements about climate change in recent months. Trump at one point said climate change was a “hoax” invented by the Chinese, and Pruitt has said that he doesn’t believe carbon dioxide is a main contributor to climate change – statements that have both been widely slammed by the scientific community. Colorado’s Democrat Senator Michael Bennet was the first to attack Trump’s order Tuesday. But he said he and Colorado would remain committed to meeting its target for clean energy and emissions under the Clean Power Plan. He also sent a letter , along with nine other U.S. senators from across the West, asking Trump to rescind the order. The renewable energy industry brings in billions of dollars each year for many western states. In 2015, 14 percent of the total electricity generated in Colorado was from wind generators , while the ranked 11th in the nation for solar energy capacity in 2016. Colorado Gov. John Hickenlooper said he would continue to work to address climate change in Colorado. “Today’s Executive Order by the President pulling back on policies addressing climate change will not deter Colorado’s efforts. Natural gas has become more economical than coal, and Colorado is a national leader on wind and solar energy, which are a boon to our economy, jobs and the environment,” he said. Democrat Reps. Jared Polis, Diana DeGette and Ed Perlmutter all denounced Trump’s order Tuesday as well, saying it would negatively affect peoples’ health. But Republican Reps. Scott Tipton, Ken Buck and Doug Lamborn applauded Trump’s order. “State and local communities know what is best for them…#energyindependence,” Lamborn tweeted. “The Obama Administration did everything in its power to pick winners and losers in American energy production. That era is now over,” Tipton said. The U.S. Energy Information Administration released a report last year showing that natural gas was set to pass coal in terms of the highest percentage share of electricity generation in the country late last year, and that forecasted generating costs were supposed to level out with coal in the next several years. "This is the end of a policy that’s designed to keep coal in the ground," said Stan Dempsey, the president of the Colorado Mining Association, who said the order will also help level the playing field with natural gas. "We’re not going to see as many mines close as quickly as they possibly could." The coal industry employs more than 2,700 people in the state, according to the Colorado Mining Association. Energy analysts, though, said the order would have little impact on energy in the state., where more than half of the electricity is generated by coal. "Trump's reversal of the Clean Power Plan is going to have a much bigger impact on the eastern half of the United States," said Bob Yu, a senior analyst with Platts Analytics, a leading provider of energy information. "In Colorado, it's going to be very, very minimal. The coal generation here is already very cheap, so it's already competitive to natural gas, and the coal retirements that are coming up are very small compared to the total stack of coal power plants." Coal has been struggling for years in Colorado, with a 32 percent drop in production last year alone. 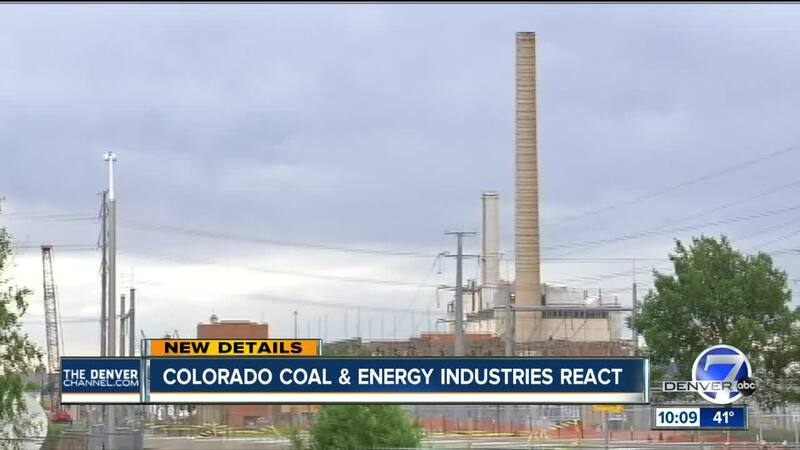 Xcel Energy recently announced more investments in wind energy, and states that under 2010 state regulations, all the Denver metro area coal-powered plants have been converted to natural gas or decommissioned. “Xcel Energy’s plans make economic and environmental sense regardless of the future of the Clean Power Plan. We intend to keep moving forward with a low-priced, clean energy strategy that provides the economical, clean energy our customers want,” said Ben Fowke, Chairman, President and CEO Xcel Energy.